Gen Laurent Nkunda, leader of the strongest rebel group in eastern Democratic Republic of Congo, has been arrested, the military says. He was detained in Rwanda after resisting a joint Rwandan-Congolese operation to arrest him, officials say. Some 4,000 Rwandan troops this week entered DR Congo to help fight rebel forces in the area. Correspondents say Gen Nkunda's arrest removes one obstacle to peace but other rebel groups remain active. BBC Africa analyst Martin Plaut says Gen Nkunda has been caught in the rapidly changing diplomatic situation in Central Africa. Gen Nkunda did not back the new alliance and so became an impediment to Rwandan plans in the region, causing Rwanda to turn on him, our correspondent says. The decision earlier this month by a group of Gen Nkunda's top commanders to break away and join forces with government troops gave them their opportunity, he adds. Henry Boshoff, an analyst from South Africa's Institute for Security Studies, told the BBC that following intense diplomatic pressure in recent months, Rwanda was obliged to arrest Gen Nkunda. The next step is for the joint Congolese-Rwandan force to tackle the FDLR Hutu rebels, some of whose leaders are accused of involvement in the 1994 slaughter in Rwanda of some 800,000 Tutsis and moderate Hutus. But Mr Boshoff says this may not be easy, as they have resisted previous attempts to disarm them. 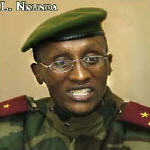 The rebel leader was detained in Rwanda after troops converged on his stronghold in the Congolese town of Bunagana. "The ex-general Laurent Nkunda was arrested on Thursday 22 January at 2230 hours while he was fleeing on Rwandan territory after he had resisted our troops at Bunagana with three battalions," a Congolese-Rwandan official statement said. Rebels with him were being urged to disarm, reports said. Congolese Information Minister Lambert Mende Omalanga, told the BBC he welcomed the arrest. "I think it is a good achievement for peace and security in this area and this region of Great Lakes," he said. DR Congo has issued an international warrant for Gen Nkunda's arrest following past accusations that his forces had committed atrocities and Mr Omalanga said he wanted Rwanda to extradite him to face justice in DR Congo. Rwanda has not yet said whether it will hand over its former ally. Some of Gen Nkunda's forces - perhaps as many as 2,000 - are still said to be loyal to him. The question now is whether they will fight, or whether they will join the new consensus and become integrated into the Congolese army, correspondents say. The CNDP launched a major offensive in August 2008, which displaced more than a quarter of a million people in North Kivu and raised fears of both a humanitarian crisis and a wider regional war. Correspondents say this may have been Gen Nkunda's undoing, by bringing huge international pressure on all sides to end the conflict in DR Congo. Human rights group have accused CNDP forces, along with those of the government, of numerous killings, rapes and torture. All sides in the Congolese conflict have also been accused of using the fighting as a pretext to loot eastern DR Congo's rich resources of minerals such as gold, tin and coltan, used in mobile phones. Some five million people are estimated to have died as a result of almost 15 years of conflict in DR Congo, following the Rwandan genocide.